Managua (Agenzia Fides) - For three weeks now, the military forces of the government have tightened controls on the protest marches of the population, preventing any kind of public demonstration in the streets of the capital. 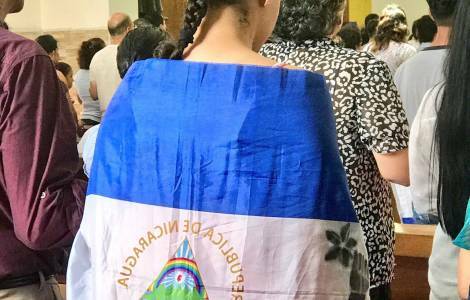 Yesterday, Sunday 21 October, a protest was held in the Cathedral of Managua, asking for justice and freedom. Among those present at the Eucharistic celebration, there were many young people who brought photos of political prisoners, whose relatives asked for their release. Father Rodolfo Lopez, who celebrated the mass at 11 am, prayed especially for political prisoners, demanding justice for Nicaraguan people. At the end of the mass all those present began to shout the names of political prisoners, one by one, and at the end they repeated: "They were students, not criminals".